← First tying video – here goes! Big respect to the person who captured this moment. WOW!!! I have often said if you want to see real truths, hang out with animals (not human animals!) 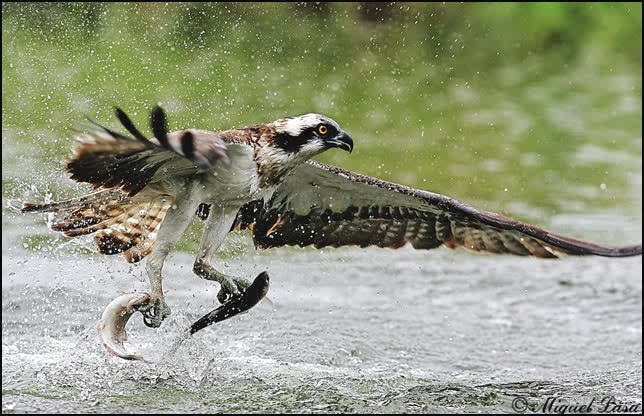 Nature is the product of an infinite number of battles won and lost – aeons of repeated actions driving instincts down through the generations on tightly woven strands of DNA… The offspring of this Osprey have a lot to live up to though. I wonder if this skill will pass on in the same way that baboons teach each other to use rocks to open shellfish? Do you think it was just a lucky accident or do you prefer to believe it was carefully planned? Several times I have been fortunate enough to witness fish eagles catch bream and tigerfish right in front of me on the Zambesi River… Take a moment to imagine it right now, from the top of the swoop to the moment of liftoff from ruptured waters. Did you remember to factor in the sound of the wind rushing though feathers…? I remember being shocked at how loud that sound is. In London the closest thing that compares is the sound of the swans in full flight (I’m deliberately failing to mention the noise of jumbo jets passing overhead as they drop the last few hundred metres into Heathrow). If you are a reader out there who has witnessed an Osprey or a fish eagle or a bald eagle catch fish in front of you please drop me a line via comments and share the experience. If you ever want to find out where the fish are lying, watch out for their winged predators and Nature will provide all the tips you need. This entry was posted in Fishing, Fly tying videos, nature conservation, Uncategorized and tagged Bald Eagle, Biology, Business, DNA, Fish, London, Nature, Osprey. Bookmark the permalink.